Contest period begins Friday, September8, 2017 and ends at 11:59pm on Sunday, January 7, 2018. 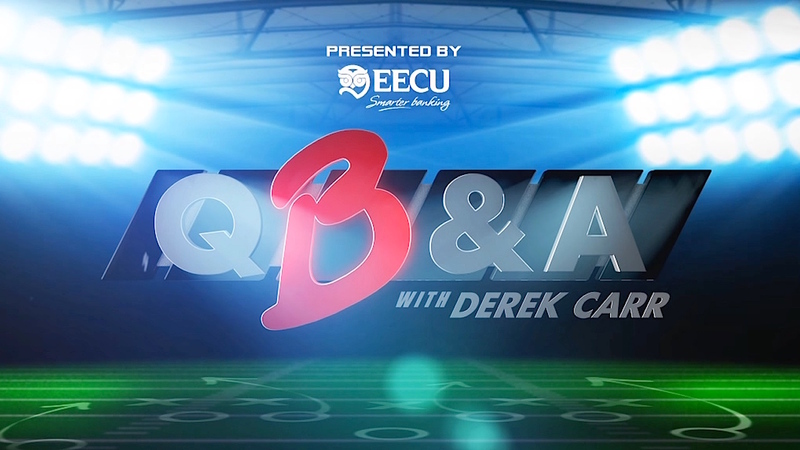 An Entrant must logon to his/her Facebook, Twitter or Instagram account and post a question that KFSN-TV/ABC30 Action News could ask professional quarterback Derek Carr during our weekly "QB&A" interview segment that airs during the contest period window. Each post must include hashtag "#AskDC4" to receive one (1) entry. An entrant must have a non-private social media account on Facebook, Twitter or Instagram to participate in the Contest and maintain such non-private account for at least sixty (60) days after the Contest Period ends to be eligible to be named a weekly winner or the potential Grand Prize winner and to claim a prize. Due to the way Facebook, Twitter and Instagram operate their services, Sponsor may not receive entries from users with "protected" accounts. Each Facebook, Twitter or Instagram post using #AskDC4 entry is herein referred to as an "Entry" (and collectively are herein referred to as "Entries"). There is no limit on the amount of "entries" any one entrant can submit. By submitting an Entry, Entrant hereby agrees to these Rules and grants permission for the Entry, including the use of the Entrant's Facebook, Twitter or Instagram account name, to be posted on ABC30, on the ABC30.com website or on other ABC30 Social media accounts for public view. All Entries are subject to verification of compliance with these Rules as determined by Sponsor and/or Administrator. Limit one (1) weekly prize winner. A person/address/household may win both a Finalist Prize and the Grand Prize. V. JUDGING AND WINNER SELECTION: All Entries will be judged based on the following criteria: originality, creativity, relevance to the theme of the promotion and potential for on-air appeal. The entry selected weekly as that week's Finalist will be the entry with the highest combined score. In the event of a tie the entry with the highest in the originality category will be selected. Weekly Winners will be selected using judging criteria specified in Section V on each Monday during the contest period, beginning with Monday, September 11, 2017 and running through Monday, Jan 8, 2018. In addition, each weekly winner selected between Monday, September 11, 2017 and Monday, November 20, 2017 will also be given one entry into our special Grand Prize drawing. Limit one weekly prize per winner for this contest. 18 Weekly Winners will receive a Wilson Official Autograph football signed by Derek Carr, professional quarterback. Approximate Retail Value per Weekly prize: $50.00. 1 Grand Prize Winner will receive a 2-pack of tickets to see the Oakland Raiders football game on Sunday, December 17, 2017 in Oakland, CA. For a list of winners, send a self-addressed, stamped envelope to 1777 G. Street, Fresno, CA 93706 c/o "AskDC4" within 30 days after sweepstakes end date.